One April evening when I was driving down a country road, I got a whiff of sweetness so intense and surprising it fair took my breath away! 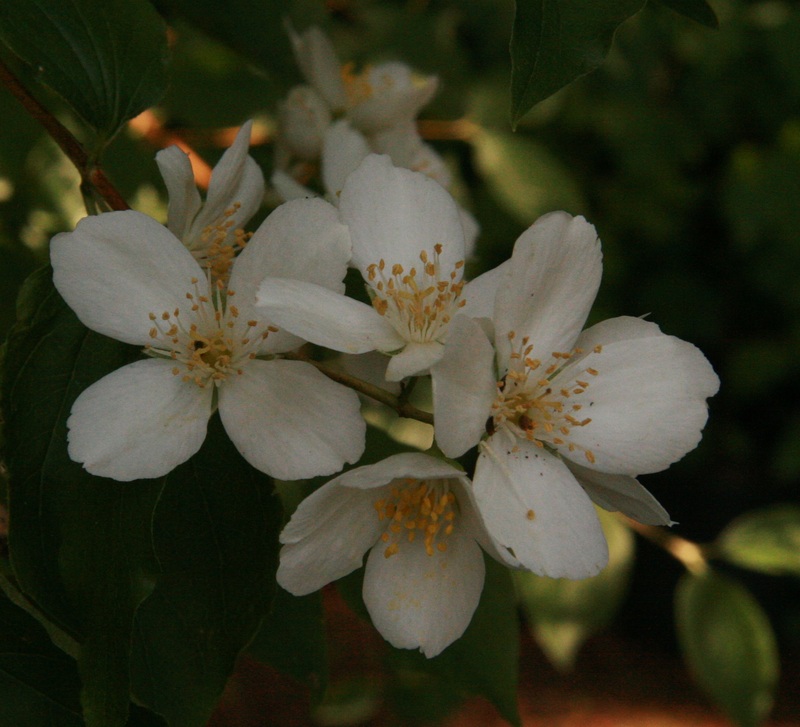 Only one plant that I know of has that beautifully sweet aroma: Mock Orange (Philadelphus lewisii). But could it be blooming so soon? 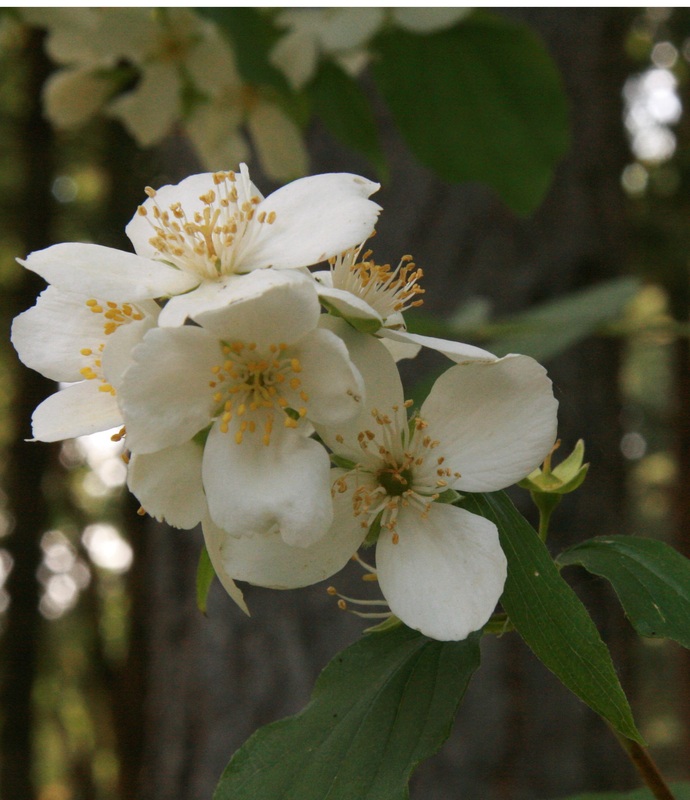 The usual bloom time for this fine northwest native shrub is May - July and it was only the latter part of April! I must take that road again and see if I can find the source of this honeyed perfume. 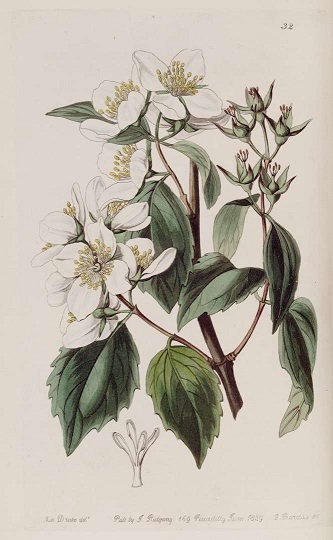 Though it's so early in the year, Philadelphus lewisii has been known to bloom the first of May. Really not so far away from today. 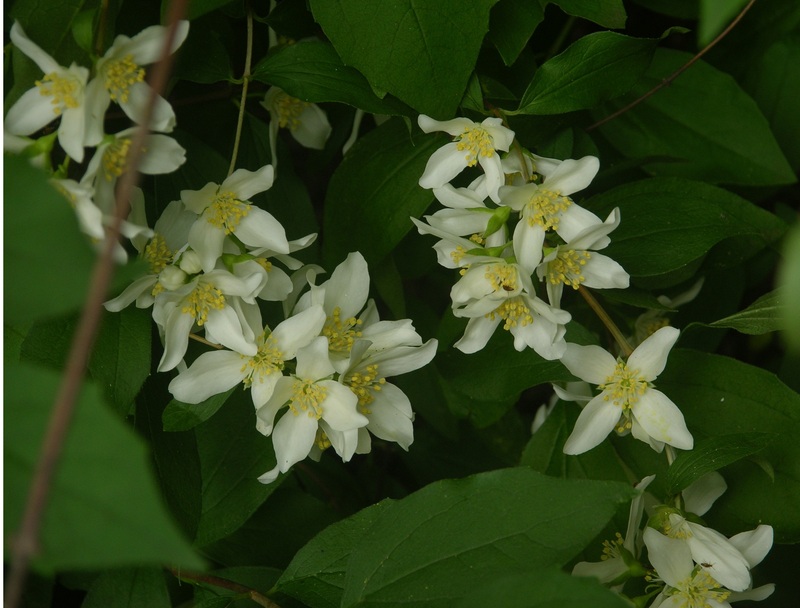 This lovely native shrub can grace your garden to be enjoyed for years. 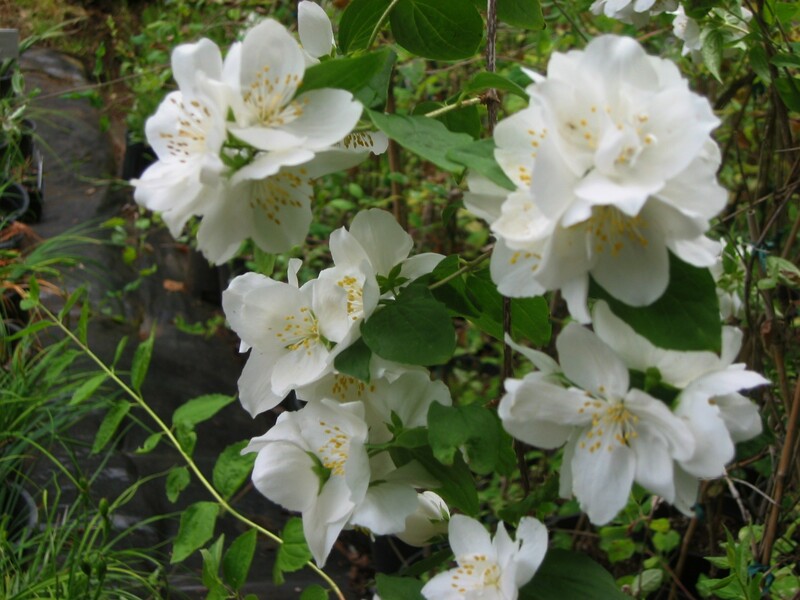 I'm going to plant one near my front door--a special treat for guests who come a-calling in late spring. 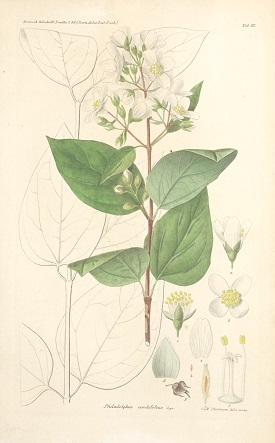 Mock Orange was first identified by Captain Meriwether Lewis during the great adventure he shared with Captain Clark and the Corps of Discovery. 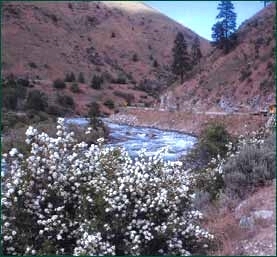 Two specimen were collected, the first along the Clearwater River between the mouth of the Potlatch River and Pine Creek in Nez Perce County, Idaho, on May 6, 1806. Later another specimen was collected along the banks of the Clark Fork of the Blackfoot River near present-day Missoula, in Montana on July 4, 1806. 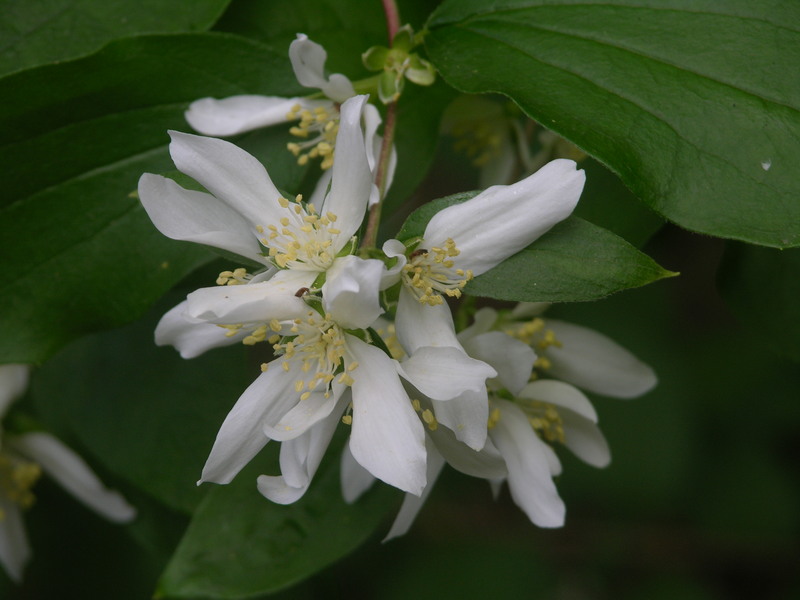 "In early June, our lowland thickets are perfumed with the rich fragrance of the Syringa, and in this month of brides and orange blossoms, the creamy-white flowers are a favorite substitute for the more conventional blooms. 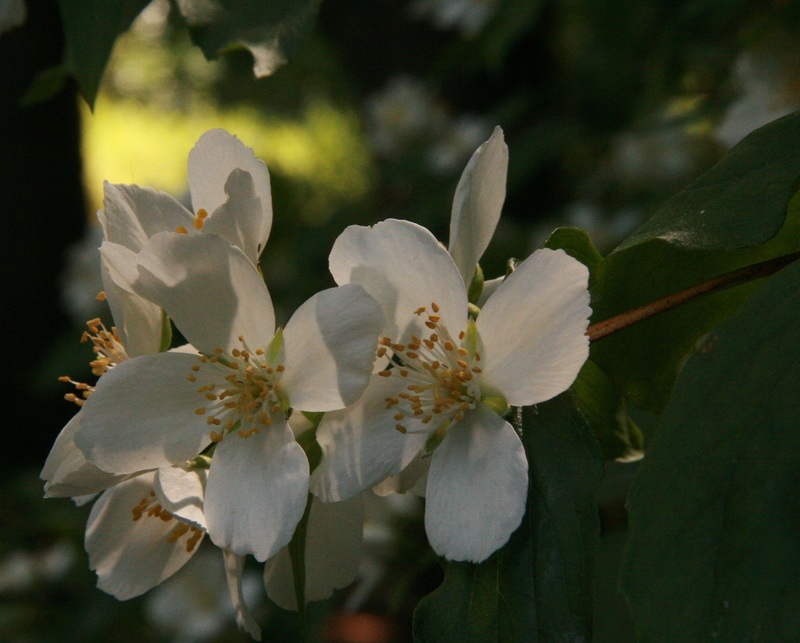 The flowers, in purity and fragrance, are quite worthy of this honor." It is extremely adaptable to soil and light conditions, very drought tolerant and requires minimal attention once established. It can take full sun to partial shade, and does just fine with water that falls from the sky here in the Willamette Valley, though in the sere summers of late it will appreciate a few supplemental drops of moisture. You'll be rewarded with more lush flowers if you choose to give this extra pampering. 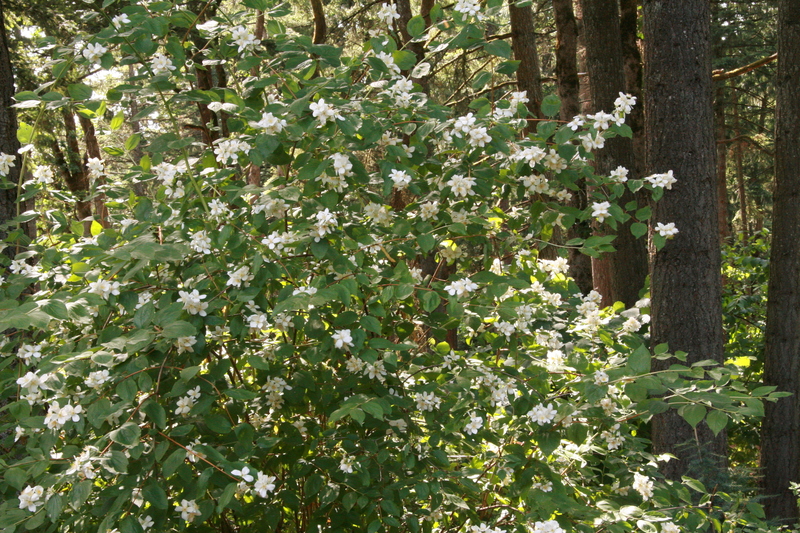 In late spring, early summer for several weeks it covers itself with full clusters of large, snow-white flowers whose scent is positively intoxicating, reminiscent of orange blossoms. 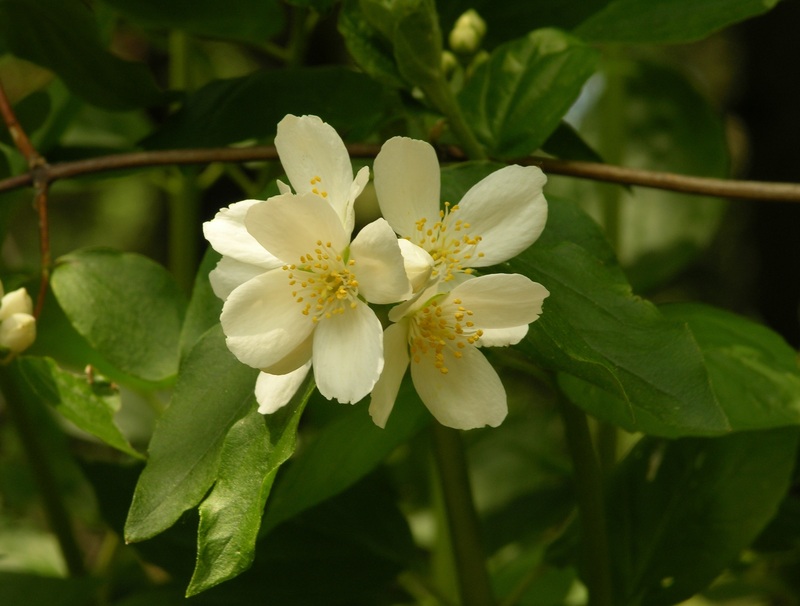 It is this perfume that gave it the common name of Mock Orange. 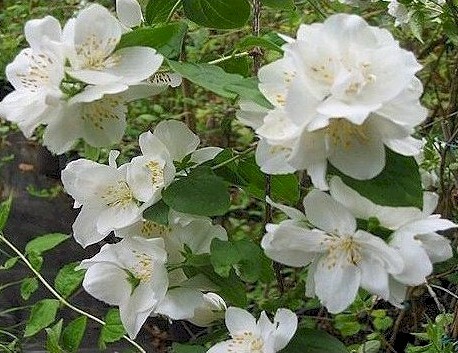 The name "philadelphus" means "brotherly love," and it is no surprise as one smell of the glorious fragrance and all traces of bitterness evaporate. 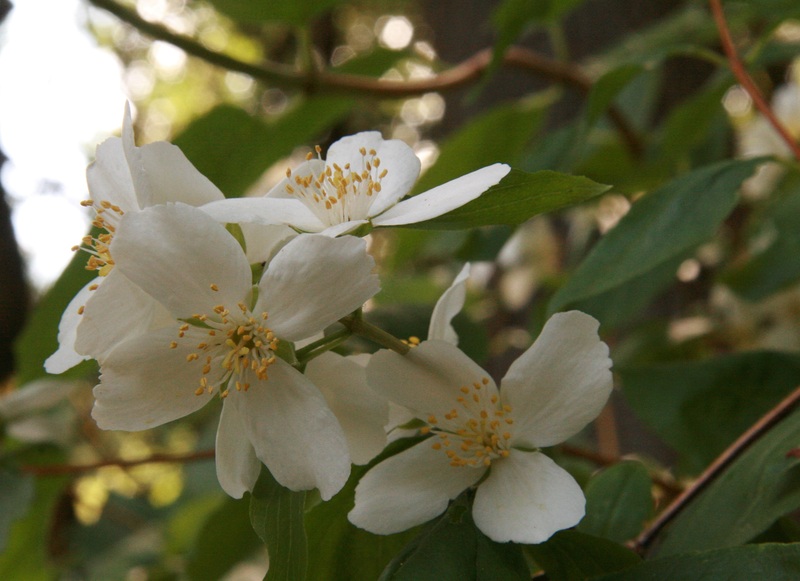 Hardy from USDA zones 5-10, Mock Orange is native from BC to California and east to Montana. 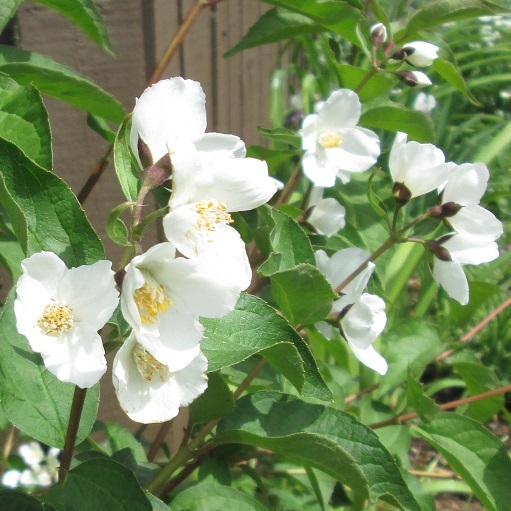 "Aristotle gave the name Philadelphus to a tree, now unknown, to commemorate Pharoah Ptolemy II Philadelphus (308-246 B.C.). Somehow the name ... was applied to this shrub. It has nothing to do with the city of Philadelphia, where a whole block once burned after the police bombed a house to keep the peace." 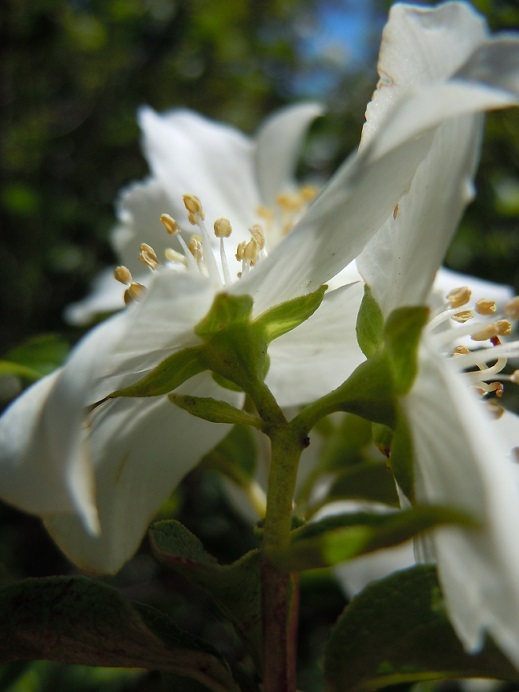 --Plants of the Pacific Northwest Coast Washington, Oregon, British Columbia and Alaska, by Jim Pojar and Andy MacKinnon, B.C. Forest Service Research Program. It is the state flower of Idaho. 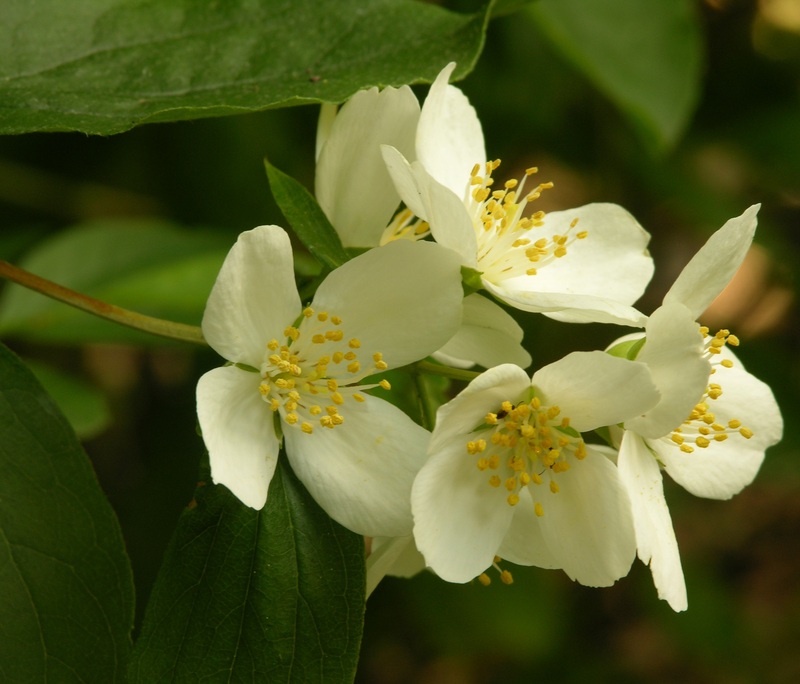 Plant it along the side of the house where the sweet perfume of the bush can be enjoyed, but do be aware that those fragrant blooms are magnets for bees and hummingbirds. Window screens should be used for windows near the plant. 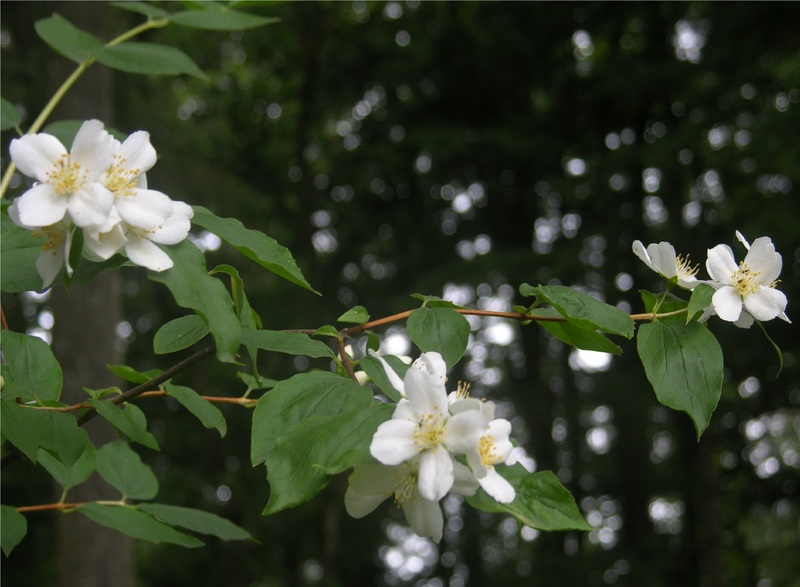 After bloom, the remaining sepals look like green flowers until they wither and die off. 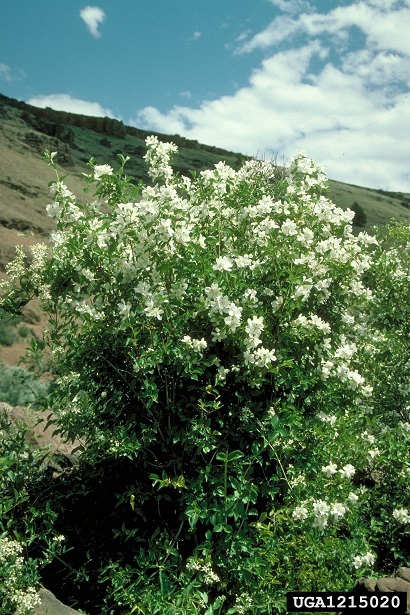 This open, multi-stemmed shrub has long stems which are red when new and fade to gray with age, the bark shredding in small flakes. 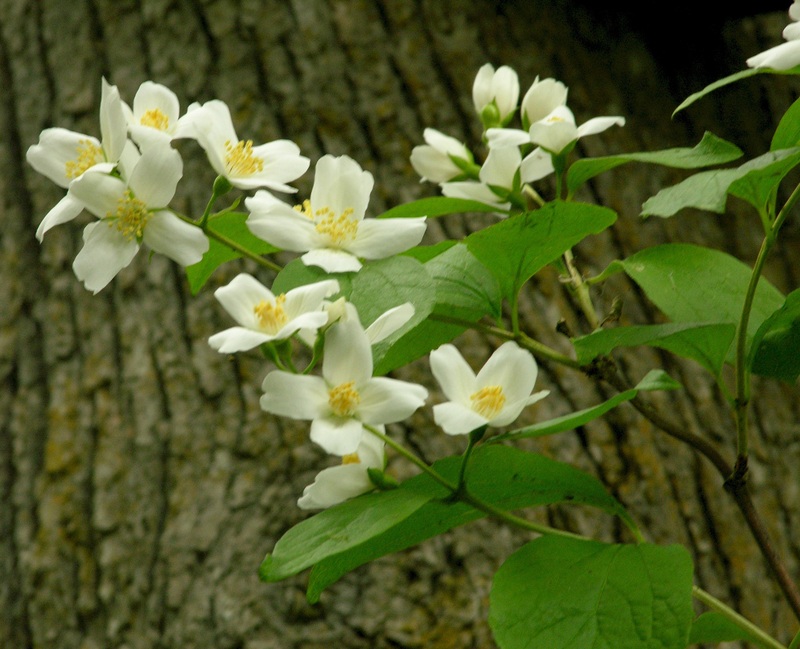 The new leaves in spring spring become darker as they age, providing the perfect accent for the white flowers with their bright yellow centers. 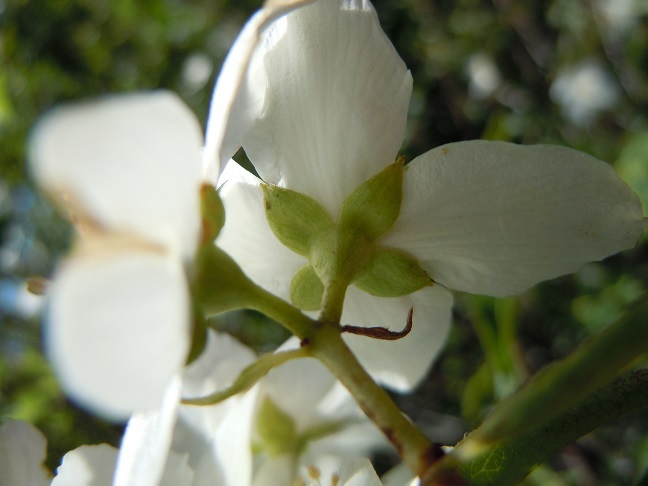 The fruit, which appears after blooming, is small hard capsules about a centimeter long with woody, pointed wings, containing many brown seeds. In the autumn, the leaves turn a buttery yellow before falling to the ground. 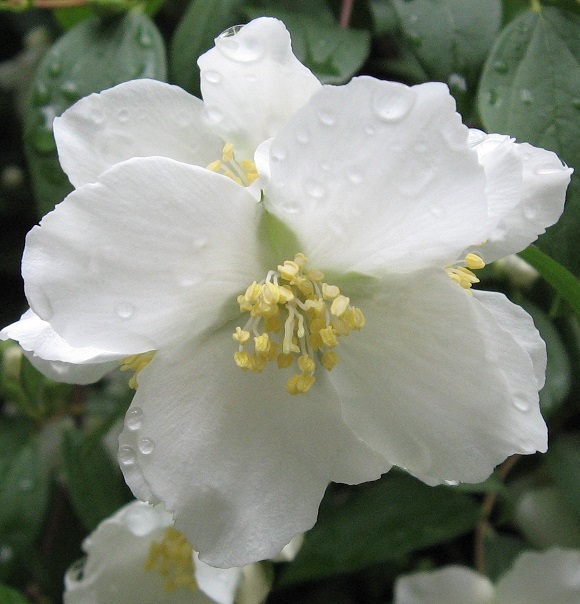 Mock Orange is very easy to care for. 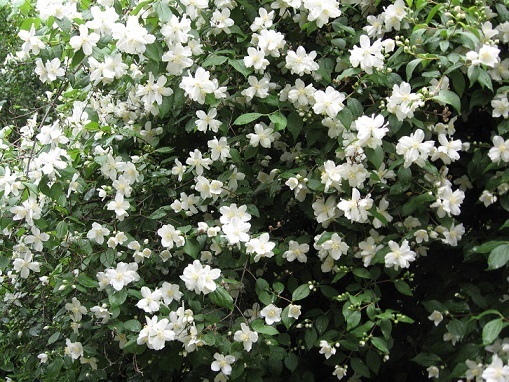 As mentioned earlier, most of the time it will not require watering or much pruning or fiddling about. Mulch is always a good idea, but if you allow the leaves to stay where they land, they will take care of that for you. Too many times, I think, we do so much cosmetic treatment to our landscapes, we create problems for ourselves whereas if we just let nature do what it does best, the ultimate goal is achieved without physical labor. 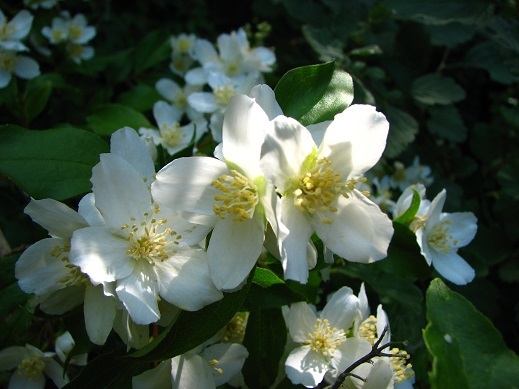 But, cutting back some of the branches after flowering will make the shrub fuller and more dense. The cuttings root easily, in fact, this plant is a dream to propagate from cutting or from seeds. Sharing extra plants with friends or neighbors is a nice thing to do. 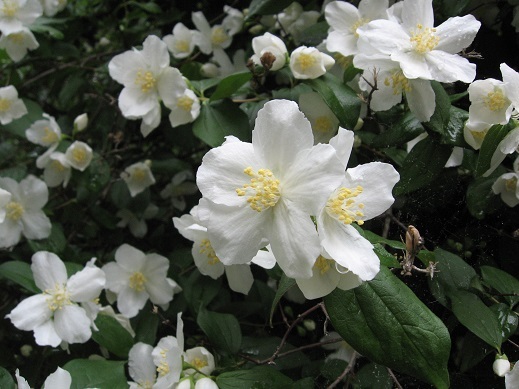 Or you might look into planting some in a row for a lovely hedge. 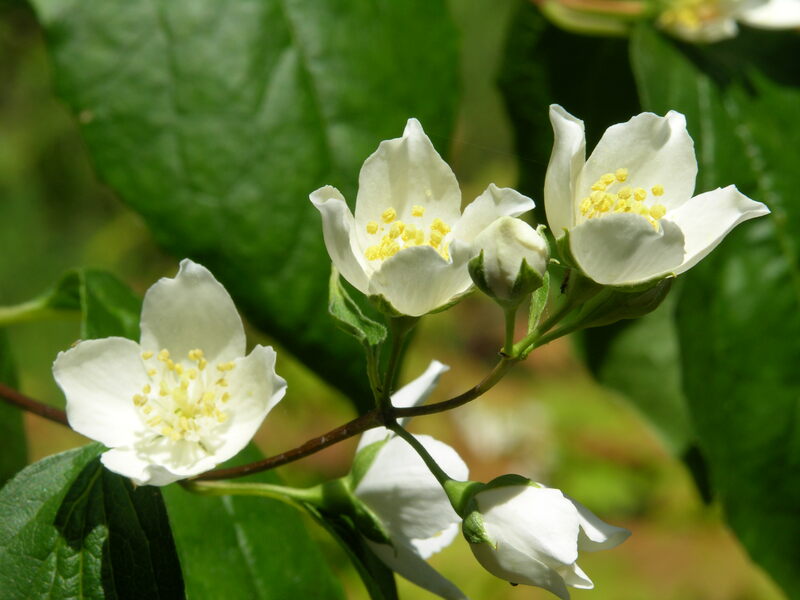 When the shrub gets older, cut about a quarter of the oldest branches to the ground every few years, thus rejuvenating the plant. Mind, you don't have to do this. The plant will do fine without it, but if you've a mind to make it even more glorious, this is a positive thing you can do that is beneficial to the plant. 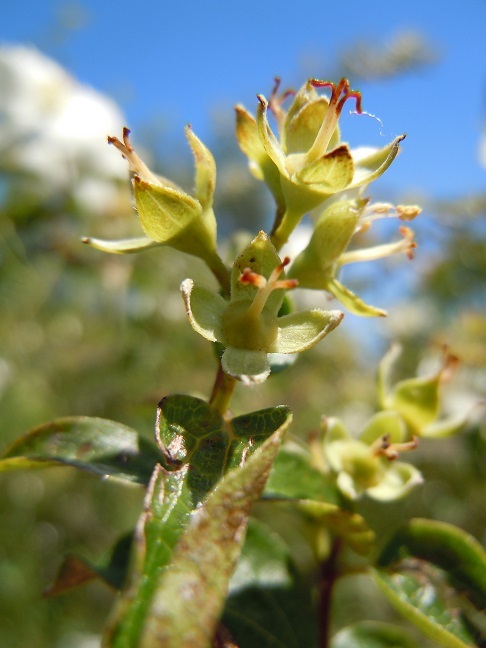 "This species is extremely variable in both vegetative and floral characteristics and appears to be particularly responsive to local ecological conditions." 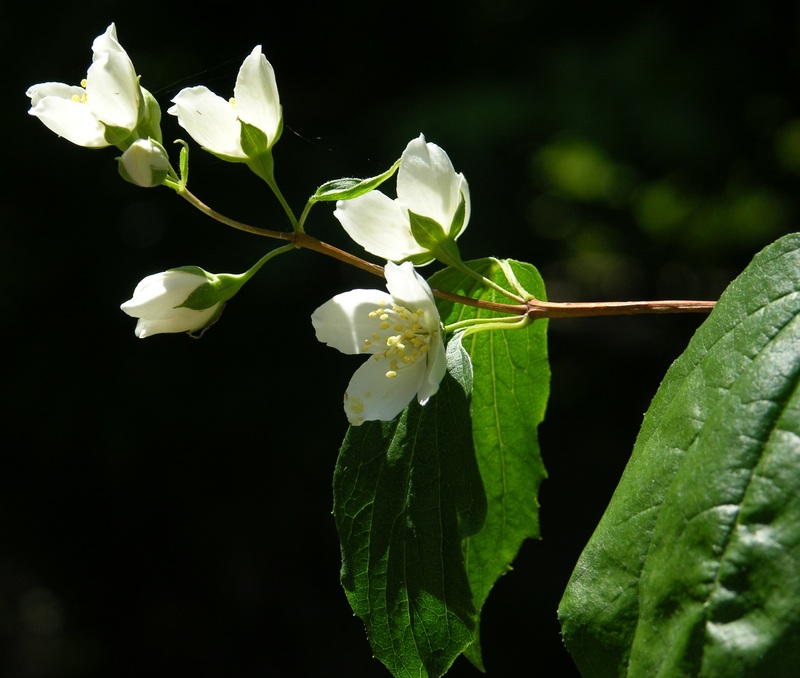 Native American tribes used this plant for numerous purposes. The hard wood was useful for making hunting and fishing tools, snowshoes, pipes, bows, combs, cradles, netting shuttles and furniture. Bruised leaves and flowers formed a soapy lather. 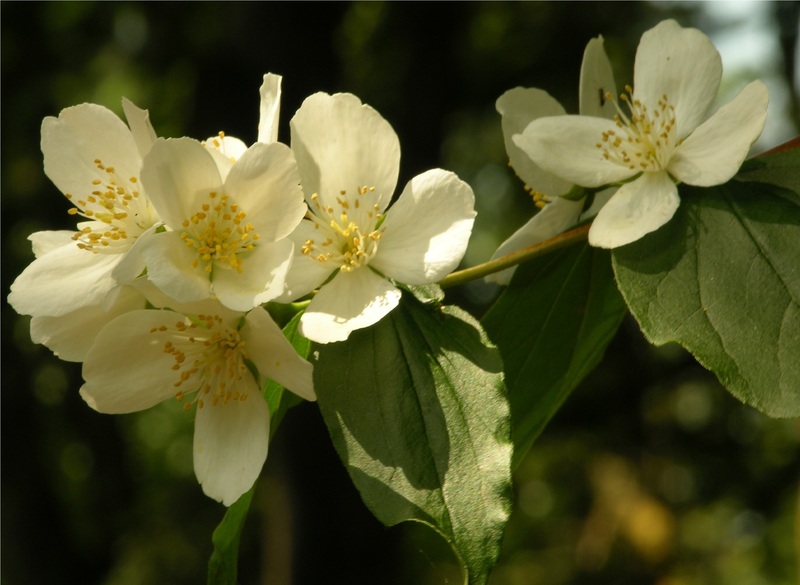 Flowers are used in preparing perfumes and teas. 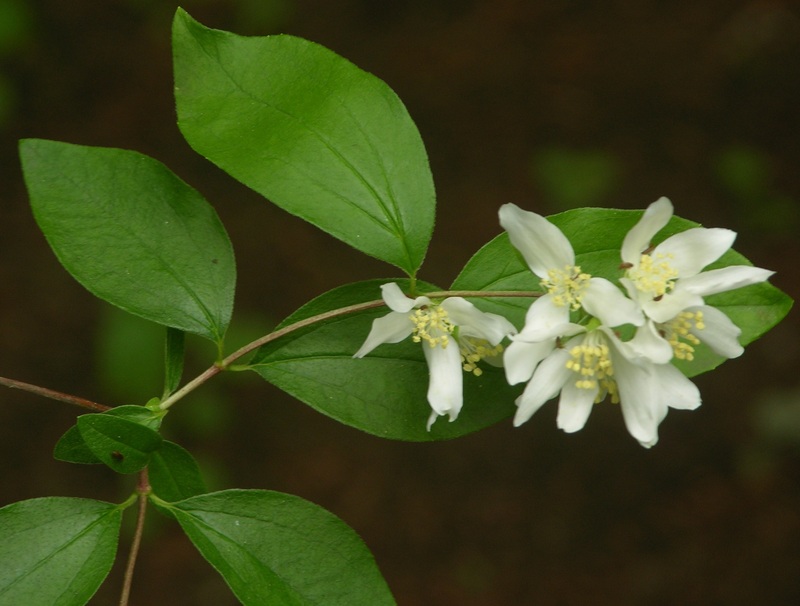 Lewis Mockorange is useful for streambank stabilization, including soil bioengineering practices such as live staking, restoration of riparian areas and moist ravines, and erosion control on hillsides and drier rocky slopes. 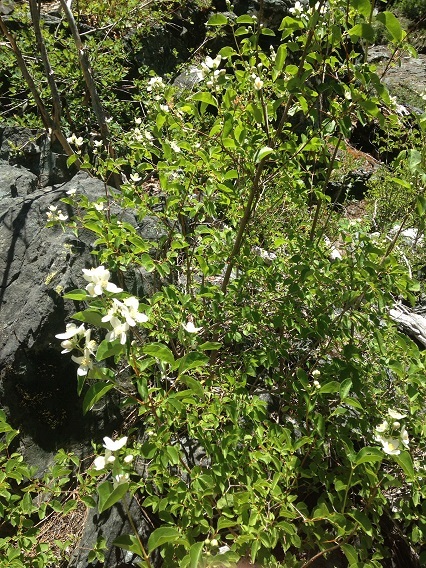 Mock orange may often be associated with riparian setting in desert canyons, but it grows away from the water often in and around rocky outcrops and loose rocky slopes. The species provides good food and cover for wildlife. It is moderately important winter browse and thermal cover for elk and deer. Quail and squirrels consume the seeds. The flowers are a source of nectar for hummingbirds as well as food for certain butterflies, bees, and other pollinators. 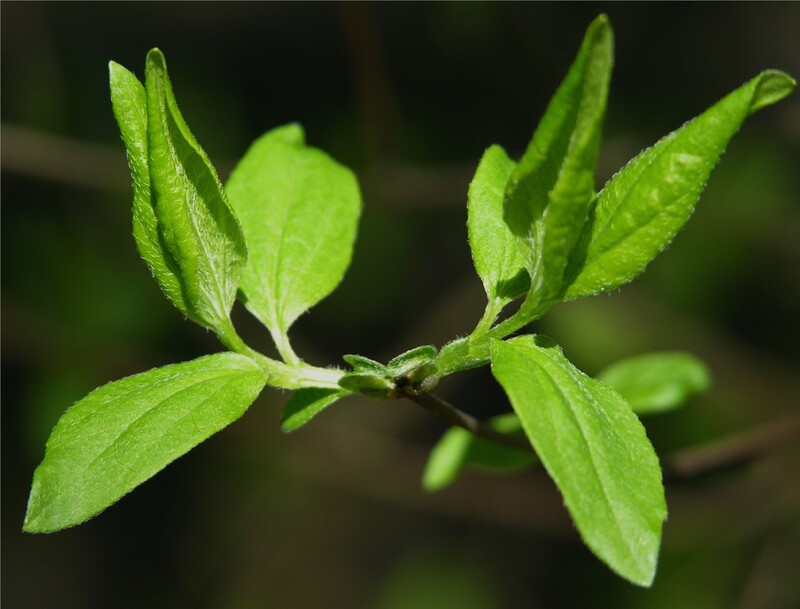 Livestock generally make light use of this plant and palatability is considered low, with exceptions. Sprouts and new shoots are very palatable. 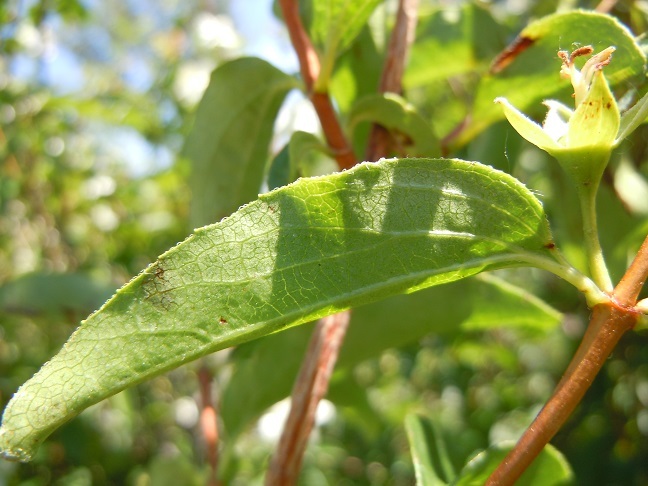 "Few insect or disease pest problems have been described, but seedlings can be susceptible to damping off. 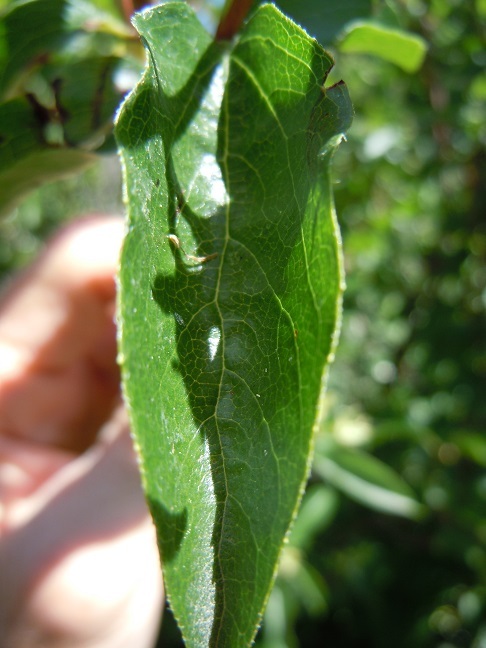 The foliage and twigs are edible to ungulates, suggesting a degree of safety. However, the species is listed as poisonous to animals and humans by the FDA’s Center for Food Safety and Applied Nutrition. 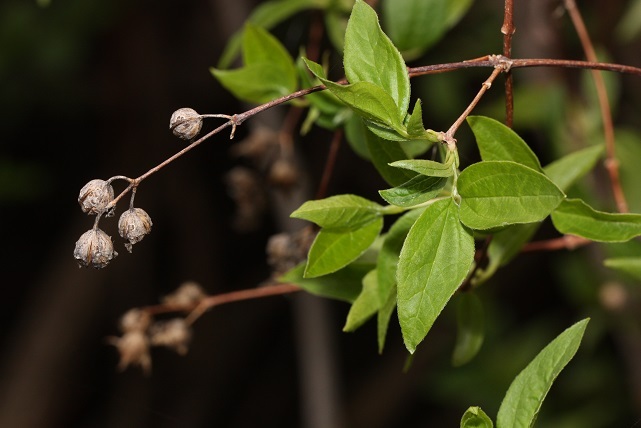 Its seeds are poisonous according to some sources, but other plant parts may be implicated. 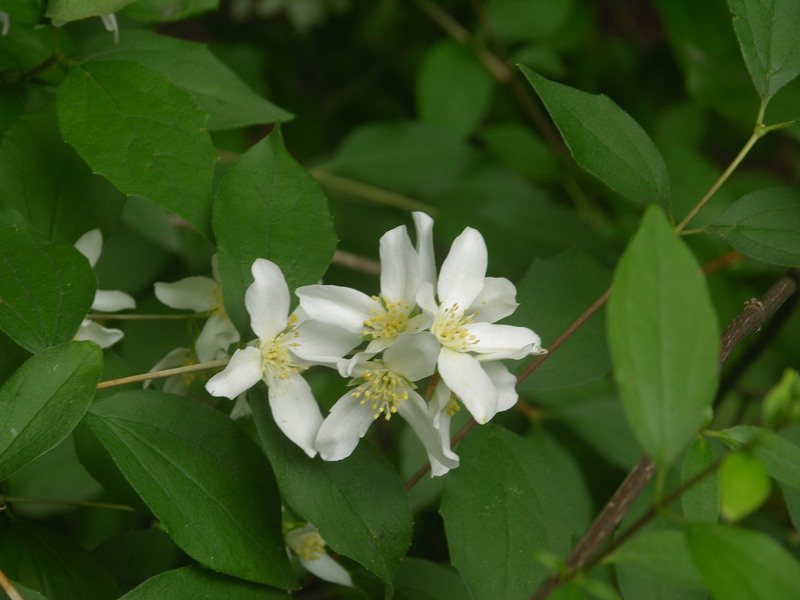 The species is generally not considered weedy. "Lewis mockorange is readily propagated by seed, stem cuttings, layering, root suckers, or division. 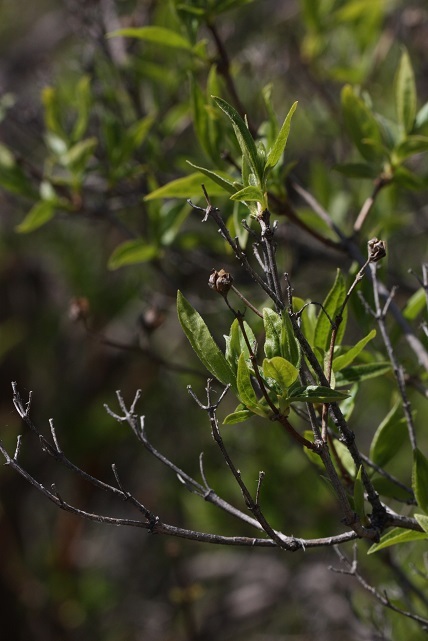 Dried capsules are collected in late summer and crushed to release the seed. The seed should be stored cool and dry but germination greatly improves with 2 to 5 months of moist cold stratification (prechilling at 1 to 5°C or 33 to 41°F) to overcome dormancy. Containers, beds for bareroot plant production, and weed free, well drained revegetation sites may be sown in the fall (untreated seed) or spring (treated seed) and the seed lightly covered. 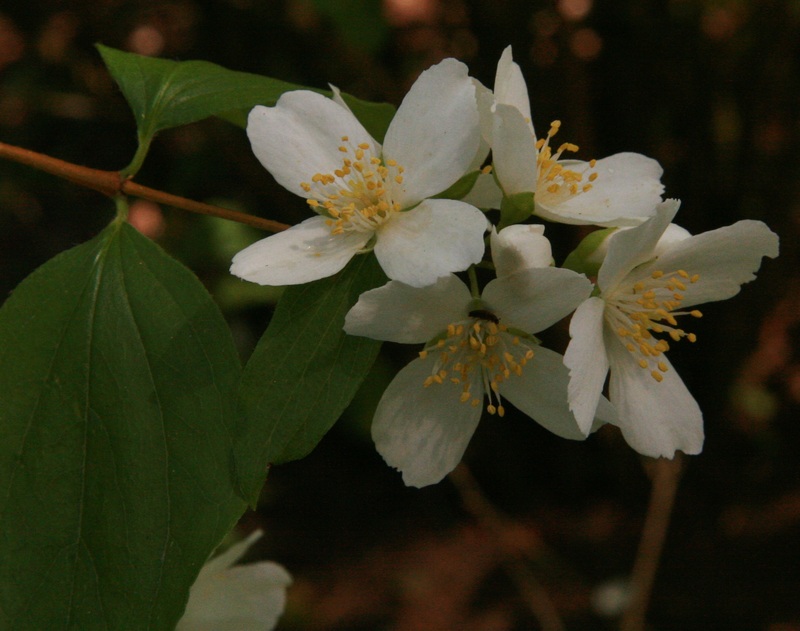 The species may be propagated from softwood cuttings taken in spring and treated with 1000 ppm of IBA (Indolebutyric acid). 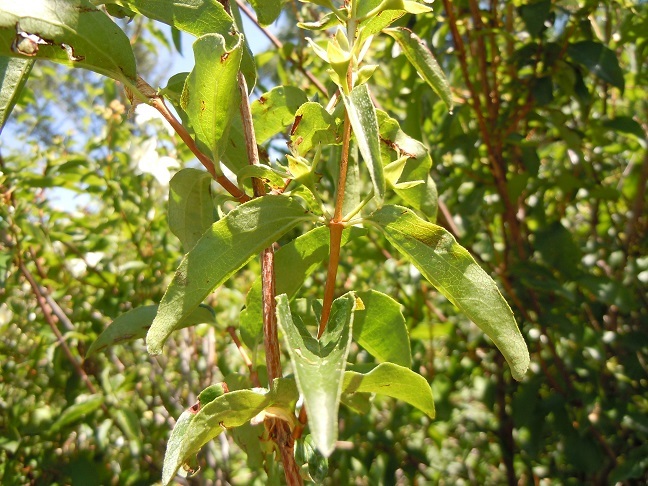 Hardwood cuttings can be similarly treated but often root readily without enhancement, allowing for direct sticking or live staking on revegetation sites. Mulch or irrigation the first summer can greatly improve establishment of unrooted cuttings and rooted stock, as can weed suppression. Fall planting is usually best."